Barbara has lived in Manchester since she came to Medical School in 1982. She chose the city for the music and the nightlife, having been raised in the wilds of Mid Wales. 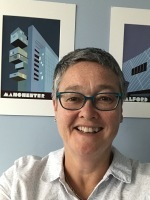 Having done lots of travelling in between training posts, she joined The Docs in 1996, when the practice patient list was less than half the size and we were renting premises on Canal Street. She was involved in the purchase and renovation of our current surgery premises on Bloom Street, and became a GP trainer in 2009. Her special interests include dermatology, gynaecology and amateur oenology. Matt was raised as a Man of Kent (East of the river Medway). Doing Natural Sciences at Trinity Hall Cambridge and then working for a pharmaceutical company in Oxford did not turn out to be his vocation. So Matt enjoyed a second studenthood at the Royal London Hospital Medical College. In between coxing, clubbing and eating a lot of curry in the East End of London, Matt got a great education in inner city medicine. Wanderlust took him to practise medicine in Heidelberg, Edinburgh, Brussels and his current resting place of Manchester. He joined the Docs in 2006. Outside of the consulting room he is a father of 2 children and is an aspiring yogi. Simon left home and initially studied in St Andrews, Scotland, before moving onto Manchester in 2002 to complete his medical training. Initially he spent a few years in the northwest training to be a surgeon before seeing the light and becoming a GP. He can be found at the weekends watching or playing rugby which probably explains his interest in orthopaedics. Simon was delighted to join The Docs in the summer of 2013. He is settling well into the practice and looking forward to the challenges ahead. His music interest is varied but he cannot deny that having seen Michael Bublé twice that probably constitutes being a fan!